The Ogee decorative curtain rod and finial set has an open, airy design with a matte finish rod and wavy iron strand sphere shape finials. This set will provide a visually balanced appearance for your window treatments. The 2.5" diameter x 2.6" long finials will insure that your window curtain panels will remain securely on the rod. The 1" diameter iron adjustable curtain rod is designed to fit a wide range of window widths, and has a sturdy 25 lb. capacity that will support flowing sheers to thermal blackout panels. The 3.5" fixed depth projection bracket provides a gracious amount of space for fabrics to drape perfectly. Accommodates window curtain panels and drapes that are designed with various tops, including: rod pocket, pinch pleat, grommets, tab top, or hidden back tab top. Provides an attractive accent to every window treatment in your living room, bed room, bathroom, kitchen, and kids room. Installs easily with included hardware and installation instructions. Sturdy, easy clean, no fuss, wipe clean finish will last for lifetime. This window curtain rod and finial set will add the perfect finish accent to any window treatment and adds a refined style to your home decor. 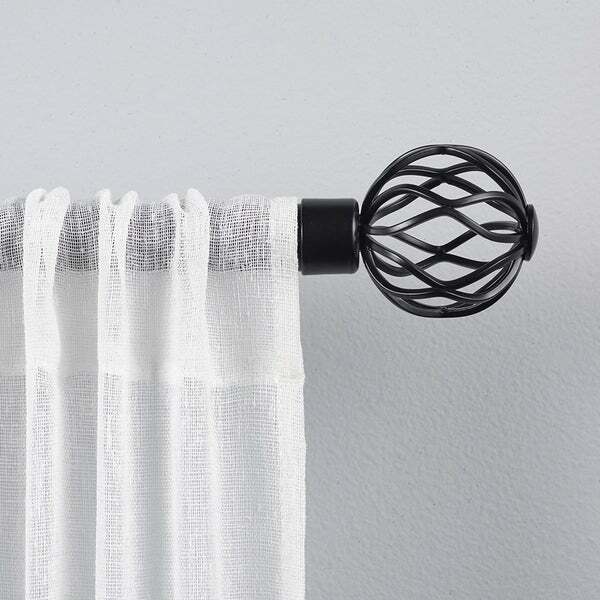 These curtain rods are exactly as described and featured in the photos. It's a simple, classic design that goes well with many decors. The finials have a set screw that can be removed which let me hang the rod close to the ceiling. Nice quality curtain rod. Quite sturdy when hung, good rod diameter to hold onto the curtains. Only issue is that the finish does scratch quite easily, however it's not that obvious once hung with curtains. Would certainly recommend. I purchased five of these rods to put in my three bedrooms. They look fabulous on the walls and go well with my curtains. I appreciate that they're beautiful and elegant. They don't attract too much attention, but add nice detail to my curtains. These arrived quickly and were very easy to install. I purchased the nickel finish to match the grommets on the curtains I purchased and it looked great! Rod came with a lot of scratches on all 3 pieces. Can visibly see scratches on the finish so its pretty disappointing. Probably wouldn't have been as bad if it were a darker finish? Also, parts received did not match the instructions included with the package. Would not recommend or purchase again. Great product, the bronze finish turned out great on this piece. Very simple to install. Bought this for my neighbor, and she loves be a it! Item was just as described. "Can you purchase middle brackets for support?" It comes with 2 brackets, we do not offer any additional on this small size. "Does this rod come with a middle bracket for additional support? Thank you!" There is not a middle bracket.